To be clear, I don't argue against that point. It's quite possible that G1's primary function involved water, and massive quantities of it. Interesting. Massive quantities of water in a tomb? 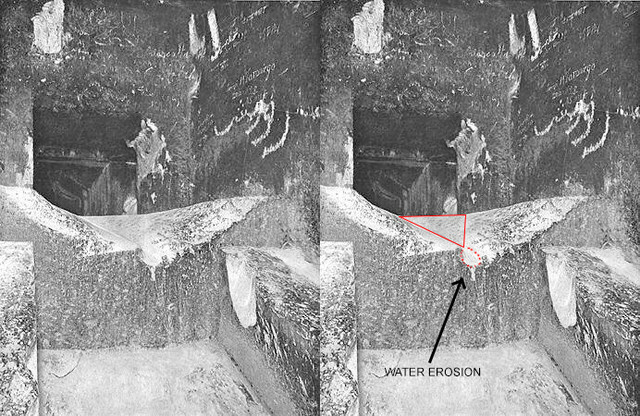 That damage is far too eratic to be the result of water erosion. Water drainage from KC would result in a straight V in line with the axis of the Antechamber portal. You don't get it. The water erosion is just there where I drew an arrow. It's just the small part with the red dots at the end of the "V". I never said that the whole block was damaged by water erosion. You keep repeating it but I never said something like that. I never said that the "V" is a result of water erosion. What I tried to show in the picture is that the "V" is carved by the pyramidbuilders. That's what's so amazing about this stoneblock and what I was trying to explain. But that V is not aligned but rather has a sideways angle to it. The V is also not symmetrical but rather has different slopes to the east and west of the valley. No. It may look that way (to you) because of the extreme perspective of the photo. From everything I've seen and read about the Great Step, I think it's far more probable that the damage is the result of deliberate manual intervention incurred perhaps by pillagers to make room to remove something big out of the KC or to drag something up the GG into the KC. Sure, and that would have created "such a sharp V" (I'm using your own words here).